Resonance Sound is back with a super smooth collection of Deep House MIDI files. Your chance to get 100 expertly programmed MIDI files for Deep House, Garage, Bass and Future House, Minimal and any other leading genres. Deep House MIDI Weapons is a massive arsenal of inspiration and ready-to-use melodies with basses, leads, chord progressions, arpeggios and pad melodies. Tags: Deep House, EDM, Electro House, House, MIDI, Tech House. Resonance Sound is back with a super smooth collection of Deep House MIDI files. Your chance to get 100 expertly programmed MIDI files for Deep House, Garage, Bass and Future House, Minimal and any other leading genres. 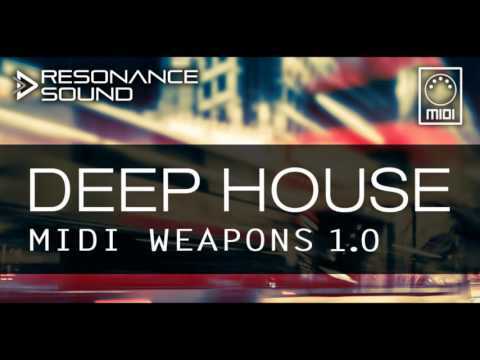 Deep House MIDI Weapons is a massive arsenal of inspiration and ready-to-use melodies with basses, leads, chord progressions, arpeggios and pad melodies. Influenced by the hottest tunes, this MIDI pack gives you the tools you need to help create your next chart topping floor filler! Start with one or more of these unique MIDI loops and easily customize them to suit your track in no time. All the MIDIs are royalty free and key-labeled to make choosing the right file even easier and properly sorted.